The combination of bright crunchy vegetables brings both colour and flavour to this light and fresh-tasting salmon salad. Each serving provides 320 kcal, 27g protein, 9g carbohydrates (of which 8g sugars), 19g fat (of which 3.5g saturates), 4g fibre and 2g salt. To make the marinade, mix all the ingredients together in a bowl. Add the salmon fillets and turn to coat. Cover and refrigerate for up to 2 hours. Meanwhile, make the salad. Toss all the ingredients together in a large bowl and set aside. Heat a medium, non-stick frying pan over a very high heat. Spray with 6–10 sprays of oil. Lift the salmon into the pan, reserving the marinade, and cook, without moving, for 2–3 minutes. Turn the fillets over, reduce the heat to low and cook for 4–5 minutes. Transfer the salmon to a warm plate to rest. Pour the marinade into the frying pan and simmer for 1 minute or until reduced to a glaze. Pour over the resting salmon and leave for 3–4 minutes. Divide the salad between four plates. Flake the salmon on top and pour over any remaining soy glaze. 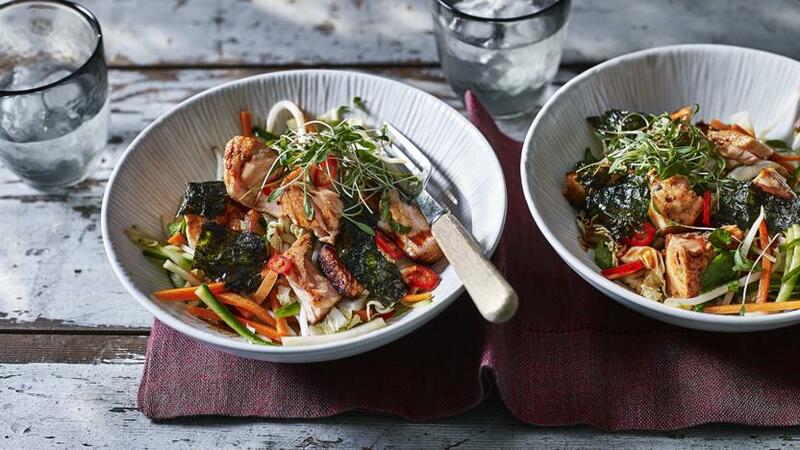 Sprinkle with red chilli, torn nori sheets and micro-herbs.